Nearly 1,000 medical practitioners in northeast China's Heilongjiang Province gathered Tuesday afternoon to mourn the death of an intern killed in a hospital attack on Friday. The memorial for Wang Hao, 28, was held at 3 p.m. at the First Affiliated Hospital of Harbin Medical University in the provincial capital Harbin. 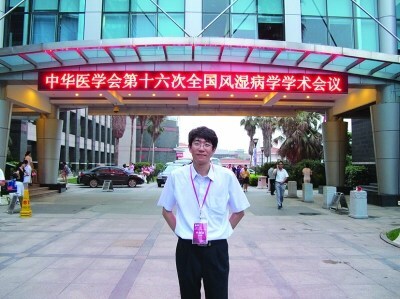 Zhou Jin, president of the hospital, said at the memorial that Wang had just before the attack received admission to study a doctorate at a Hong Kong-based medical university. Health Minister Chen Zhu issued a statement Tuesday, mourning the loss and calling for the murderer to be severely punished. The incident occurred at 4:30 p.m. Friday when a patient allegedly attacked Wang and three other medical workers at the hospital with a knife. The injuries of the other three were serious but not life threatening, according to local police. Police captured the alleged attacker, a 17-year-old man named Li Mengnan, when he was receiving emergency treatment as he tried to kill himself following the attack. Li was suffering from ankylosing spondylitis, a chronic disease that causes inflammation around the spinal vertebrae. He told the police that doctors at the hospital had a terrible attitude and "deliberately rejected" treating him. He said this was the motivation for his attack. However, a doctor on condition of anonymity said Li also suffered from tuberculosis, and he was advised to treat tuberculosis at a chest hospital before treatment of ankylosing spondylitis. Remicade used to treat ankylosing spondylitis may be fatal to tuberculosis-carrier, the doctor said. A further investigation is under way. The provincial health department issued an urgent circular Saturday, urging hospitals and medical institutions to install alarms, cameras and access control systems to strengthen security for medical workers. A health ministry circular issued Tuesday called for security protection measures to be beefed up in all medical institutions and health authorities compounds. A security protection system featuring around-the-clock monitoring over key sections and departments in hospitals and clinics should be formed, according to the circular. "Greater efforts should be made to explore efficient ways for solving disputes arising from medical treatments and between health care staff and patients," the circular said. The ministry also stressed improving the ability of medial staff in communication with patients through greater training efforts. The tragedy has caused concern among medical practitioners, as well as their families. "It's too dangerous. I dare not allow my daughter to be a doctor any more," said a mother, whose daughter Zheng Yining was among the injured. Zheng suffered knife injuries on the right side of her face, and was receiving treatment. The case is not alone in China. Last September, a patient stabbed a surgeon in Beijing Tongren Hospital and seriously injured her following a medical dispute, in which the patient alleged that the surgeon had committed malpractice during an operation. Experts believe the tension between doctors and patients is a reflection on China's defective medical system, which now is being reformed. In China, doctors often work long hours without reasonable pay, and their relations with patients strained as many patients are dissatisfied with difficult access to treatment, high medical fees, and in some cases, "unfriendly attitude" of doctors. Ling Feng, a renowned neurosurgeon and a senior member with the Chinese Medical Doctor Association, said the salaries of doctors are relevantly low. "It takes a person more than 10 years to study at medical school before becoming a doctor, but the average monthly salary for a young doctor is only 3,000 yuan (476 U.S. dollars)," she said. Public hospitals in China are similar to government-funded institutions, where practitioners are paid based on their job titles. A bonus system rewards doctors based on total monetary value of the prescriptions they write, leading to a higher income, up to 8,000 per month for a chief physician, but also greater work pressure. The system also led to an increase in the number of prescriptions issued, creating high cost burdens for patients. In 2009, the Chinese government unveiled a 850-billion-yuan three-year plan for health care reform. The plan aims to provide universal and affordable medical services to the country's 1.3 billion people. Public hospital reform projects include favorable policies for public hospitals in the areas of city planning, medical staff training and funding. Ling advised the government to further increase spending on health care, raising doctors' salary and lowering patients' cost, in which she believes is the fundamental way to ease the tension. She also called for strengthened communication training for medical practitioners to avoid further tragedies.